Order a Barrington Stoke wall chart – Bounce Sales & Marketing Ltd.
Young readers can pick their next exciting read or track their progress with the Barrington Stoke at-a-glance wall chart. 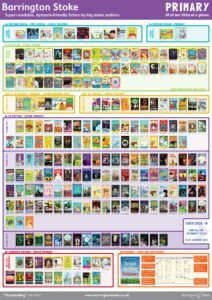 A double sided poster featuring Barrington Stoke’s Primary and Secondary titles organised by interest and reading age for easy progression. Great for keeping in-store or giving away.